Introduction: My name is Maria Magaldi. I'm a junior in high school from Connecticut. This year my U.S. history teacher gave my class a chance to pick a topic for our research papers as long as we used primary sources. 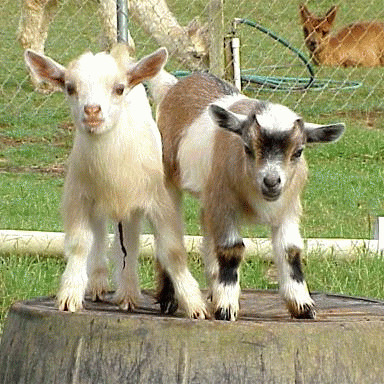 I keep a small farm of Nigerian Dwarf goats and I was curious about a program another goat keeper said she was "forced into" called NAIS. I decided to research it and educate myself as it could potentially affect me and my goats in the future. As I researched and discovered more and more about the National Animal Identification System, I became furious and decided, after I wrote my paper, that I wanted to share what I found with the world. It is the 21st century and the U.S. is one of the major world powers. Having used Roosevelt's "big stick" to control Cuba, the Philippines and the surrounding U.S. territories, the government is now turning to its own citizens to wield a new stick-a microchip smaller than a penny. With the approval of the U.S. Department of Agriculture (USDA) and the U.S. Food and Drug Administration (FDA), these microchips-marketed mainly by the Digital Angel Company-are being injected into animals across America. The purpose is to further implement the USDA's brainchild, the National Animal Identification System (NAIS). This program is being promoted as a way to enable the government to track the movements of animals in order to more quickly eradicate a disease. Although NAIS could potentially help officials contain a widespread livestock epidemic, it is nevertheless unconstitutional as its operation infringes on animal owners' constitutional rights and its possible mandatory establishment would be medically and ethically harmful. (3) Tracking/tracing the animals on a database. Registering a premise requires filling out a form provided by the USDA including one's address, phone number(s), and operation type. In return, one receives a small card with a Premise Identification Number (PIN), a unique seven digit code containing both letters and numbers. So far 459,859 out of an estimated total of 1,438,280 premises have been registered with the USDA-that's 32%. Step two: identifying animals is when each individual animal is registered with the USDA and given a 15 digit Animal Identification Number (AIN). The animal's background is recorded onto a database. USDA states that officials can access this information in "the case of an animal health event." "... manufactured RFID microchips for millions of pets throughout the world, providing them with unalterable and permanent identification should they become lost or stolen... [and] pioneered RFID solutions to help farmers, ranchers, sale barns and other livestock producers to identify and track animals in efforts to ensure the health and safety of the world's food supply." RFID is radio frequency identification technology-a microchip or a device containing a microchip. With the support of mass companies such as these and a standard microchipping device, the USDA can more easily implement the NAIS plan. However, the majority of farms and animal owners in the U.S. do not support the NAIS. These people are the small farmers, the 4-Hers, the FFA members; the backyard animal owners who only have small herds of animals. And yet, these people are feeling the majority of the pressure of NAIS and the government. Hundreds of anti-NAIS websites and newsletters bear headlines demanding rights for the small farmer. In Bonnie Jameson's article published in the May/ June 2007 edition of the Dairy Goat Journal, she wrote how her daughter received an Oklahoma NAIS Premise ID card when she registered for a local FFA livestock show. Zealous farmer, Lynn Miller wrote a passionate article for the Small Farmer's Journal describing the potential problems that farmers will encounter when the NAIS program becomes mandatory. He believes that the numbers of small farmers will decline and be driven out by government red tape and fines until all farming and food production is left up to the major industries. Essentially, it is not NAIS' goal of eradicating disease that is sparking controversy within farming communities, but the actions one needs to take while complying with the program and the possible consequences of the actions that are the roots of the debate. Animal owners are wary of the fact that the government will store their personal information including their address, full name, phone number, and type of farm on a national database if they fill out the NAIS premise form. The USDA says that it will need this information in an emergency. In a report to the Congressional Requesters of the GAO (Government Accountability Office) on homeland security and agroterrorism attacks, the USDA testifies that in the case of a disease outbreak that has been confirmed by USDA technicians, "the affected herd and all cattle, sheep, goats, swine, and susceptible wildlife-infected or not-within a minimum 10 kilometer zone around the affected farm would be killed...slaughtered and disposed of by incineration, burial, or rendering," (Homeland Security 31). So if the USDA had access to premise information during a disease outbreak and knew that a farmer lived within the 10 kilometers, the farmer's livestock would be wiped out even if the herd was operating on a closed basis. Later, the government could find out by a second test that the medical result was false positive and that there never was a disease rampant in the area. There is also the unconvincing claim made by the USDA that NAIS is a voluntary operation. Nevertheless, states have the power to decide if they want NAIS to be mandatory. The NAIS official User Guide states "Under our current authorities, USDA could make the NAIS mandatory, but we are choosing not to do so...participation in every component of NAIS is voluntary at the federal level" (NAIS User Guide). However, farmers and rural landowners have been receiving yearly envelops from the Agriculture Identification Survey (AIS) which clearly state on the front that "your response is required by law". It also states that by neglecting to fill out the information, one will be fined $100. In Mary Zanoni's article in the 2006 March/April edition of Dairy Goat Journal, she states that although the AIS denied that they were connected to NAIS, the USDA claims that the AIS envelopes and information were "done through a contract with the USDA National Agricultural Statistics Service" (Zanoni 2006 Agricultural Identification System 10). Then there is the term dubbed "critical mass" by the USDA. Critical mass is NAIS' benchmark, when the USDA will evaluate the progress of NAIS and decide whether there is enough participation. It is NAIS' hope to have 70% livestock participation by the year 2009 (NAIS). It is implied that if the critical mass is not reached, the program will become either mandatory or at least more strongly enforced. "U.S. Department of Agriculture materials say that the goal is full, mandatory participation by 2009" (Boyer ¶1). Forced participation and an added cost burden is enough to make American farmers cringe.